TORONTO, ON (June 13, 2018) - Canada Basketball announced today the 26 athletes who have been invited to attend the Women's National Team Program Assessment Camp from June 14-21 at the Saville Community Sports Centre in Edmonton, AB. 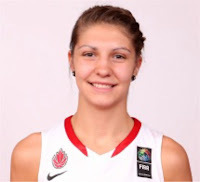 Manitoba's Emily Potter is included in that invite list. 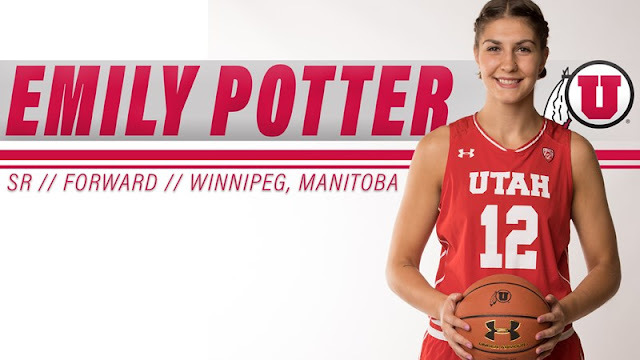 Emily just completed her final year at the University of Utah and was recently at a WNBA training camp with the Seattle Storm last month. Earlier this week, she was added to the Glenlawn Collegiate Wall of Fame. "I can't wait to see all of the athletes and re-connect with them after their respective seasons," said Lisa Thomaidis, Head Coach, Senior Women's National Team. "So many Canadians had excellent seasons on their respective professional and collegiate teams, so I'm excited to see the progress everyone has made." Following the Women's National Team Program Assessment Camp, Canada will also hold Phase 1 Training Camp (June 22-July 3) at the Saville Community Sports Centre and this will be followed by exhibition games. "We are excited to be hosting Turkey in Edmonton as our senior team's home base and to showcase the athletes and team to Canadian fans," said Denise Dignard, Director Women's High Performance. "As we begin the second year of the quad, these exhibition games will provide valuable competition mileage to our athletes and coaches as we prepare for the 2018 FIBA Women's Basketball World Cup." Canada's Senior Women's National Team will face Turkey in a three-game exhibition series as the Edmonton Grads International Classic returns to the Saville Community Sports Centre in Edmonton on July 4-7. Single game tickets and full tournament passes are now available here for as low as $8.00. For more information on the Edmonton Grads International Classic, click here. After successfully defending their FIBA Americas title last summer, Canada is currently ranked a program-high 5th in the FIBA World ranking presented by Nike. Canada will be participating in its 4th consecutive FIBA Women's Basketball World Cup and looking to build on its 5th place in 2014.